The University’s Office of Research has announced the launch of a new internal grant program to provide seed funding for faculty research. The funding effort, named the Collaboration for Unprecedented Success and Excellence (CUSE) Grant Program, is part of Invest Syracuse, a $100 million University initiative to enhance academic excellence and the student experience. 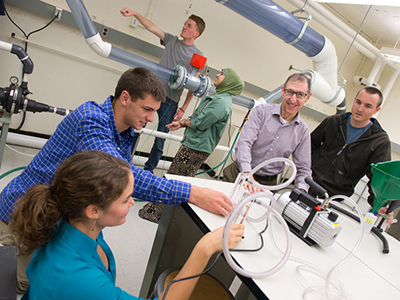 The CUSE program will support faculty research in all disciplines, including basic, translational and applied sciences; social sciences; physical and life sciences; engineering; liberal arts and humanities; and professional studies; as well as creative research and other scholarly activities. The grant program seeks to foster interdisciplinary collaborations, grow the research enterprise and enhance University-based scholarship in order to increase extramural funding and high-quality scholarly output. It is designed to support faculty in becoming competitive in securing external funding and sponsorship. The program will support faculty research in all disciplines, including basic, translational and applied sciences; social sciences; physical and life sciences; engineering; liberal arts and humanities; and professional studies; as well as creative research and other scholarly activities. The expectation is that CUSE-funded faculty members go on to seek extramural support that will increase national and international recognition of awardees, their programs, and the University. Seed Grant: The funding levels of these grants are capped at $5,000 per grant for a period of up to two years. Applications can be individuals or teams. Innovative and Interdisciplinary Research Grant: Funding levels are capped at $30,000 per grant for a period of up to two years. Applications can be individuals (innovative) or teams (interdisciplinary research). Good to Great Grant: Funding levels are capped at $30,000 per grant for a period of up to two years. Applications can be individuals or teams. Interdisciplinary Seminar Grant: Funding levels are capped at $10,000 per grant. Applications can be individuals or teams. The deadline for submitting applications for the CUSE Grant Program is Jan. 31. For more information on the program, types of grants or the application process, go to the Internal Grant Programs link at research.syr.edu or click here.